Free fatty acids created during the digestion of infant formula cause cellular death that may contribute to necrotizing enterocolitis, a severe intestinal condition that is often fatal and occurs most commonly in premature infants, according to a study by University of California, San Diego bioengineers. Their report, which was based on in vitro tests comparing the digestion of fresh human breast milk and nine different infant formulas, was published online in the journal Pediatric Research. Scientists have long known that premature infants fed formula are more likely to develop necrotizing enterocolitis than those fed breast milk. The condition is the leading cause of death from gastrointestinal diseases in premature infants, but the underlying mechanism has not been understood. Alexander Penn, a research scientist working in the Microcirculation Laboratory of bioengineering Professor Geert Schmid-Schönbein from the UC San Diego Jacobs School of Engineering, believes they have come closer to an answer. Microscopic image of cells shows the effects of breast milk vs. infant formula digestion. Cells are alive and healthy after the digestion of breast milk (top row) with only one cell having any deformation. In contrast, the cells in the bottom row all ruptured after being exposed to the digestion of infant formula. Image Credit: Alexander Penn, Department of Bioengineering, UC San Diego Jacobs School of Engineering. Blue tint added for visual clarity. Penn and others had previously determined that the partially digested food in a mature, adult intestine is capable of killing cells, due to the presence of free fatty acids which have a “detergent” capacity that damages cell membranes. The intestines of healthy adults and older children have a mature mucosal barrier that may prevent damage due to free fatty acids. However, the intestine is leakier at birth, particularly for preterm infants, which could be why they are more susceptible to necrotizing enterocolitis. Therefore, the researchers wanted to know what happens to breast milk as compared to infant formula when they are exposed to digestive enzymes. They “digested,” in vitro, infant formulas marketed for full term and preterm infants as well as fresh human breast milk using pancreatic enzymes or fluid from an intestine. They then tested the formula and milk for levels of free fatty acids. They also tested whether these fatty acids killed off three types of cells involved in necrotizing enterocolitis: epithelial cells that line the intestine, endothelial cells that line blood vessels, and neutrophils, a type of white blood cell that is a kind of “first responder” to inflammation caused by trauma in the body. Overwhelmingly, the digestion of formula led to cellular death, or cytotoxicity – in less than 5 minutes in some cases – while breast milk did not. For example, digestion of formula caused death in 47 percent to 99 percent of neutrophils while only 6 percent of them died as a result of milk digestion. The study found that breast milk appears to have a built-in mechanism to prevent cytotoxicity. The research team believes most food, like formula, releases high levels of free fatty acids during digestion, but that breast milk is digested in a slower, more controlled, process. 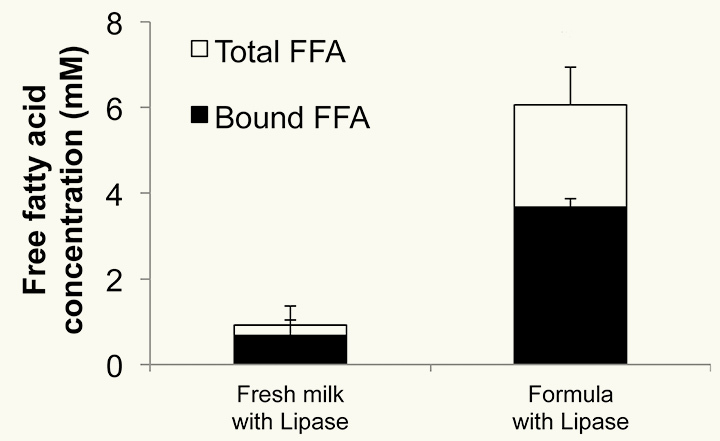 Chart shows the high concentration of unbound (cytotoxic) free fatty acids (FFAs) (shown in white) created by the digestion of infant formula compared to the relatively small presence of free fatty acids formed through the digestion of breast milk. Bioengineers at UC San Diego reported in the journal Pediatric Research that these free fatty acids are toxic to cells and may contribute to necrotizing enterocolitis, an often fatal condition that most commonly occurs in premature infants. Alexander Penn, Department of Bioengineering, UC San Diego Jacobs School of Engineering. Currently, many neonatal intensive care units are moving towards formula-free environments, but breastfeeding a premature infant can be challenging or physically impossible and supplies of donor breast milk are limited. To meet the demand if insufficient breast milk is available, less cytotoxic milk replacements will need to be designed in the future that pose less risk for cell damage and for necrotizing enterocolitis, the researchers concluded. This may be of benefit not only to premature infants, but also to full-term infants at higher risk for disorders that are associated with gastrointestinal problems and more leaky intestines, such as autism spectrum disorder. Dr. Sharon Taylor, a professor of pediatric medicine at UC San Diego School of Medicine and a pediatric gastroenterologist at Rady Children’s Hospital-San Diego, said the study offers more support to an already ongoing push by hospitals, including neonatal intensive care units, to encourage breastfeeding even in more challenging circumstances in the NICU. For patients who are too premature or frail to nurse, Dr. Taylor said hospital staff should provide consultation and resources to help mothers pump breast milk that can be fed to the baby through a tube. The research was carried out in collaboration with Dr. Taylor, Karen Dobkins of the Department of Psychology, and Angelina Altshuler and James Small of the Department of Bioengineering at UC San Diego and was funded by the National Institutes of Health (NS071580 and GM85072). The researchers conclude that breast milk has a significant ability to reduce cytotoxicity that formula does not have. One next step is to determine whether these results are replicated in animal studies and whether intervention can prevent free fatty acids from causing intestinal damage or death from necrotizing enterocolitis.